Join us for an upcoming event. Interested in scheduling an event? Contact Linda. A Celebration of the Life and Work of Acclaimed Poet, Colette Inez, at the B'nai Jeshurun Synagogue, New York, NY. https://www.lindanemecfoster.com/wp-content/uploads/2017/09/LindaNemecFoster_LOGO.png 0 0 Administrator https://www.lindanemecfoster.com/wp-content/uploads/2017/09/LindaNemecFoster_LOGO.png Administrator2019-03-31 12:00:002019-03-26 10:53:38A Celebration of the Life and Work of Acclaimed Poet, Colette Inez, at the B'nai Jeshurun Synagogue, New York, NY. Grand Rapids Book Launch for "The Elusive Heroine: My Daughter Lost in Magritte", Schuler Books & Music, Grand Rapids, MI. https://www.lindanemecfoster.com/wp-content/uploads/2017/09/LindaNemecFoster_LOGO.png 0 0 Administrator https://www.lindanemecfoster.com/wp-content/uploads/2017/09/LindaNemecFoster_LOGO.png Administrator2019-03-26 19:00:002019-04-16 14:06:20Grand Rapids Book Launch for "The Elusive Heroine: My Daughter Lost in Magritte", Schuler Books & Music, Grand Rapids, MI. Book presentation of The Lake Michigan Mermaid for teachers and professors, Saginaw Valley Teachers' Conference. Linda Nemec Foster and Anne-Marie Oomen lead workshops, book presentations, and a reading series class for students and faculty at Pine Manor College, Chestnut Hill, MA. Book presentation of The Lake Michigan Mermaid with authors Linda Nemec Foster and Anne-Marie Oomen, Glen Arbor Art Center, Glen Arbor, MI. Book presentation of The Lake Michigan Mermaid with authors Linda Nemec Foster and Anne-Marie Oomen. Authors Linda Nemec Foster and Anne-Marie Oomen will present a program and sign copies of their new book at The Bookbug Bookstore in Kalamazoo, Michigan. Linda and co-author Anne-Marie Oomen are interviewed on the radio talk show, Between the Lines, by Zinta Aistars on WMUK (102.1 FM), the NPR affiliate in Southwest Michigan on the campus of Western Michigan University. Back by popular demand, Linda Nemec Foster (poet, writer, and DWW member) leads a writing workshop, Living the Creative Life, at the Detroit Institute of Arts. Book presentation of The Lake Michigan Mermaid with authors Linda Nemec Foster and Anne-Marie Oomen, East Grand Library, East Grand Rapids, MI. Book signing for The Lake Michigan Mermaid with authors Linda Nemec Foster, Anne-Marie Oomen, and illustrator Meridith Ridl, LaFontsee Gallery, Grand Rapids MI. Book presentation of The Lake Michigan Mermaid for the general public in the West Michigan community, Aquinas College, Grand Rapids, MI. Book presentation of The Lake Michigan Mermaid for students, faculty, and staff, Aquinas College, Grand Rapids, MI. Book signing for The Lake Michigan Mermaid, Horizon Books, Traverse City location, 243 E. Front Street, Traverse City, MI 49684. Linda Nemec Foster and Anne-Marie Oomen will present a program for their new book, The Lake Michigan Mermaid, at the Leland Township Public Library, Leland, MI. Traverse City Book Launch for The Lake Michigan Mermaid, Centerpointe Banquet Facility, Traverse City, MI. Grand Rapids Book Launch for The Lake Michigan Mermaid, Schuler Books & Music, Grand Rapids, MI. Book signing for The Lake Michigan Mermaid at the AWP Conference and Bookfair. Book signing for The Lake Michigan Mermaid at the AWP Conference and Bookfair. Wayne State University Press' exhibit booth. https://www.lindanemecfoster.com/wp-content/uploads/2017/09/LindaNemecFoster_LOGO.png 0 0 Administrator https://www.lindanemecfoster.com/wp-content/uploads/2017/09/LindaNemecFoster_LOGO.png Administrator2018-03-08 14:00:002018-03-27 19:35:38Book signing for The Lake Michigan Mermaid at the AWP Conference and Bookfair. AWP’s is now the largest literary conference in North America. Join us in Tampa, FL, in 2018 to celebrate the best of what contemporary literature has to offer. Accompanied by haunting illustrations The Lake Michigan Mermaid offers a tender tale of friendship, redemption, and the life-giving power of water. Linda is poet-in-residence at Orchard View School for the sixth-grade class. Presentations, readings, workshops, and individual instruction will take place with all the sixth graders. In this informal salon, Linda will discuss the poems she was commissioned to write as Grand Rapids’ first Poet Laureate (2003-05), read several favorite poems from her six collections in print, and talk about new work that has recently been honored with national awards and recognition. Linda participates in a poetry reading to celebrate the anthology, Poetry in Michigan/Michigan in Poetry (New Issues Press) at the Leland Township Library, Leland, MI. Linda’s poem, “The Dream of the Crescent Moon,” is featured in the annual Fountain Street Church exhibit, Art and Poetry. Linda’s poetry is featured in a panel of readings and discussions at the second annual conference of “The Future of the Catholic Literary Imagination” held at Fordham University (Lincoln Center, Manhattan location). Linda leads a writing workshop, Living the Creative Life, at the Detroit Institute of Arts. Participants will first have an art tour of several iconic pieces exhibited at the DIA. Linda will then discuss the nature of creativity and lead writers from all genres in writing exercises that utilize other creative arts (like the wonderful works at the DIA) to expand their writing experiences. Linda joins Miriam Pederson, Daneen Wardrop, and Hedy Habra as Kazoo Books celebrates National Poetry Month. Linda is poet-in-residence at Pine Ridge Elementary School for the fourth-grade class. Presentations, readings, workshops, and individual instruction will take place in every fourth-grade classroom. Linda is a sponsor for “Poetry & the Creative Mind: Celebrating National Poetry Month.” This gala event is organized by the Academy of American Poets and benefits the Academy’s national programs. Linda reads in Mount Pleasant as part of Central Michigan University’s Wellspring Literary Series. Linda joins Miriam Pederson, Daneen Wardrop, and Hedy Habra as Schuler Books & Music celebrates National Poetry Month. The event, promoted as “The Fearsome Foursome: Michigan Women Poets,” features poetry readings. In solidarity with the Women’s March on Washington, Linda joins other poets (including David Cope, Todd Kanenko, and Caitlin Horreck) in a reading to celebrate women. Linda participates in New Issues’ 20th Anniversary Celebration and is invited to read a poem from Talking Diamonds. Other writers include Gail Martin, David Dodd Lee, and Kathleen McGookey, Bell’s Eccentric Cafe, Kalamazoo, MI. For more info, www.wmich.edu/newissues. Linda participates in “Expressions in Ink” sponsored by Water Street Gallery. The program involves poets and writers creating new work inspired by the art exhibition, “Abstractions: Acoustic.” Other participants include Susan Ramsey, Alison Swan, Kathleen McGookey, and D. J. James. Water Street Gallery, 98 Center Street, Douglas, MI 49406. For more info, contact Krista Reuter at (269) 857-8485. 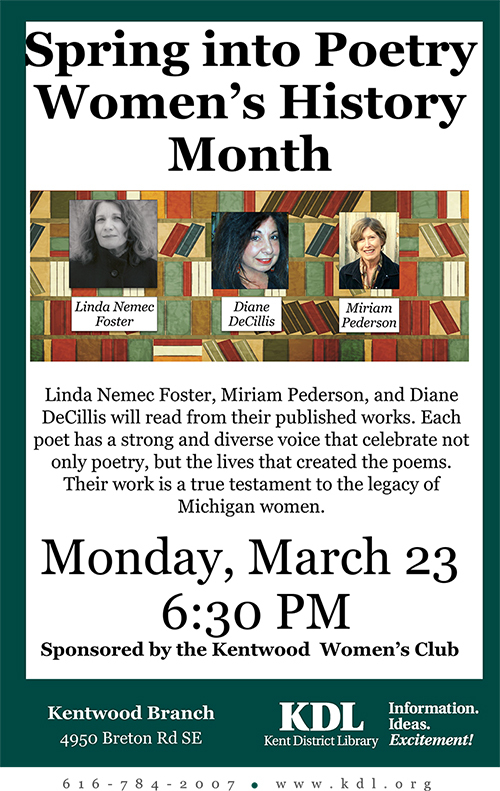 The Kent District Library (Kentwood Branch) celebrates Women’s History Month with a poetry reading featuring three diverse women poets: Linda Nemec Foster, Miriam Pederson, and Diane DeCillis. Kentwood Library, Breton Road, Kentwood, MI. Free and open to the public. For more information, contact Greg Lewis at glewis[at]kdl.org. View large version of event’s poster here. Linda is joined by jazz composer and pianist, Steve Talaga, as they perform Contemplating the Heavens, a unique fusion of poetry and music. For the poetry reading, Linda will be accompanied by the nine-member ensemble, Nonet, conducted by Talaga. This program is the debut event of the new Underground Series sponsored by Lazaro Vega, Jazz Director of Blue Lake Public Radio. LaFontsee Galleries, 833 lake Dr. SE, Grand Rapids MI (phone 616-451-9820). Tickets are $20 in advance / $25 at the door; $10 for students with a student ID. Advance tickets are only available from www.adventuremusic.org. For more information, visit the website. Linda is poet-in-residence at St. Stephen’s School (East Grand Rapids, MI) for all the students in grades 5-8. Presentations, readings, workshops, and individual instruction will take place during the two-day residency. Linda participates in a joint poetry reading/musical performance of “Cry of Freedom” with musician Laszlo Slomovits. Q&A, book/CD signing will follow the presentation. OLLI program at Aquinas College, Browne Center, 1607 Robinson Road SE, Grand Rapids, MI. For more information, contact Carol Gunst at (616) 632-2430. Linda participates in a reading and discussion centered around the anthology, Poetry in Michigan/Michigan in Poetry (New Issues Press). 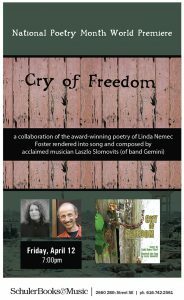 Linda participates in a joint reading/musical performance and CD release event for “Cry of Freedom” which features Linda’s poetry rendered into song by Laszlo Slomovits. Set to a wide range of music–rich ballads, quiet elegies, and expressive folk and blues tunes–these powerful poems-now-songs about people living on the edges of society are witnesses to the common dignity of people everywhere. Linda will read her poems and Laz will sing them. Q&A and book/CD signing to follow. Linda serves as poet-in-residence in the main gallery at Meijer Gardens and Sculpture Park for area high school students. Registration required. Frederik Meijer Gardens & Sculpture Park, 1000 East Beltline Ave. NE, Grand Rapids, MI 49525. Concordia University Kreft Art Series, Earhart Manor Ballroom, 4090 Geddes Rd., Ann Arbor, MI. For more info, call the university at (734) 995-7358. Linda reads new work for M.L. Liebler’s Detroit Tonight Live with poets Mindy LePere, Suzanne Scarfone, Alise Alousi, and John Jeffire. Musical guest, Leonardo. The Detroit Jazz Cafe at Music Hall, 350 Madison, Detroit, Michigan. Linda is the Poet-in-Residence for Pine Ridge Elementary School, Ada, Michigan. This residency is sponsored by the Cultural Arts Committee of the Forest Hills Public School District. September 29, 2013 2:00-4:00 PM. June 29, 2013 3:00-5:00 PM. Linda gives a poetry reading in memory of Lara Gabriel van Dongen during a ceremony in her honor near the UN’s European headquarters, Geneva, Switzerland. Friday, April 5 7:00-9:00 PM. Linda will participate in a reading and book signing for the anthology, Song of the Owashtanong: Grand Rapids Poetry in the 21st Century (Ridgeway Press, 2013). Ryerson Auditorium of the Grand Rapids Public Library (main branch), 111 Library Street NE, Grand Rapids, Michigan. Other poets included in the book are Miriam Pederson, Rodney Torreson, David Cope, L.S. Klatt, Carmen Bugan, and Eric Greinke. The event is free and open to the public and will mark the book launch for this anthology. Friday, April 12 7:00 PM. Performance of Cry of Freedom, poetry/music collaboration of Linda Nemec Foster and Laszlo Slomovits. Linda conducts poetry workshops for middle-school and high school students for the Hanneke Beaumont sculpture exhibit at Meijer Gardens and Sculpture Park, Grand Rapids, MI. Linda Nemec Foster is invited by Grand Rapids Mayor George Heartwell to read her poem, “La Grande Vitesse,” in celebration of Grand Rapids before the mayor’s State of the City address to community leaders. DeVos Hall, Grand Rapids, MI. Linda is the poet-in-residence at Pine Ridge Elementary School in Ada, Michigan. Linda discusses her poetry in the context of contemporary literature. Guest lecture and presentation for advanced poetry course, Aquinas College, Grand Rapids, Michigan. Linda Nemec Foster is the featured poet–along with poets Miriam Pederson and L.S. Klatt — for the final event in the Grand Rapids Poets’ Conference. Grand Rapids Community College, 2nd floor, Library. FREE. For more info on this event and the other April events listed below, Go to http://cms.grcc.edu/grpoetsconference. Linda Nemec Foster presents a panel on Working with a Publisher. FREE Grand Rapids Community College, Sneden Hall–Room 108. Linda Nemec Foster presents a poetry/music collaboration, Ten Songs from Bulgaria, with musician Laszlo Slomovits. FREE Grand Rapids Community College, Sneden Hall–Room 108. Linda Nemec Foster presents a panel on Local Reading Series for the Grand Rapids Poets’ Conference. FREE Grand Rapids Community College, Sneden Hall–Room 108. Poetry reading at Great Lakes Bookstore in Big Rapids, Michigan. As part of Ferris State University’s Annual Celebration of the Arts, Linda will participate in a reading along with novelist, Elizabeth Stolarek. For more info, contact Lynn Anderson at [email protected]. Throughout this month, Linda will be presenting poetry workshops to students from area middle schools and high schools at Frederick Meijer Gardens and Sculpture Park in celebration of the Deborah Butterfield exhibit. For more information, contact Heidi Holst at (616) 974-5225 or [email protected]. OLLI Institute at Aquinas College. Linda will give a presentation and in-depth discussion of the many nationally (and internationally) famous poets, writers, and playwrights that have read for the Contemporary Writers Series at Aquinas College. In celebration of the Series’ 15th Anniversary, she will talk about how this program has engaged the west Michigan community in an ongoing and vibrant literary conversation. Poetry residency at Pine Ridge School in Ada, Michigan. Linda Nemec Foster will present a poetry reading and discussion in conjunction with the international arts festival, ArtPrize. The subject of her presentation will be Poetry, Art, and the Natural World. Catholic Information Center at Cathedral Square, 360 Division Ave., Grand Rapids, MI, Gallagher Room. For more information, contact Irene Strom at (616) 459-7267 ext. 1801. Linda Nemec Foster will give a reading of her work to celebrate the 15th season of the Contemporary Writers Series at Aquinas College. Linda will be joined by novelist Patricia Gussin and memoirist John Otterbacher. Aquinas College, 1607 Robinson Rd. SE, Grand Rapids, MI, Wege Center Ballroom. This event is free and open to the public. For more information, contact Pam Luebke at [email protected] or visit the CWS website at http://www.aquinas.edu/cw/11-12feat.html. Linda Nemec Foster joins other winners of the 2011 Springfed Arts Writing Contest in a reading and celebration of poetry and short fiction. Besides Linda, other winners include Zilka Joseph, Joe Ponepinto, Sophia Rivkin, Olga Klekner, John Jeffire, and Mary Minock. Hosted by John D. Lamb. The gallery is located at 33535 Woodward Ave., Birmingham, Michigan, phone (248) 792-6248. This event is free and open to the public. For more info, contact John Lamb at [email protected]. Tuesday, July 12, 5:00 PM-8:00 PM. Poetry reading with Michigan poets and writers including Eric Torgersen, Phillip Sterling, Darrin Doyle, Patrick McGinnity, and Jennifer Burd. Negaunee Public Library, Negaunee, Michigan. For more info, contact Ron at [email protected]. Thursday, July 14, 1:00 PM-3:00 PM. Poetry workshop inspired by the theme of Poetry and the Landscape. Informal discussion and writing of new work will be featured. Vista Theater, Negaunee, Michigan. For more info, contact Ron at [email protected]. Saturday, July 16, 3:00 PM-4:00 PM. Booksigning at the Country Village Bookstore, Ishpeming, Michigan. Linda will be signing copies of all six of her books in print: Living in the Fire Nest, Contemplating the Heavens (book and CD), Amber Necklace from Gdansk, Listen to the Landscape, Ten Songs from Bulgaria, and Talking Diamonds. For more info, contact Ron at [email protected]. Saturday, July 16, 5:00 PM-6:30 PM. Panel discussion with prominent Michigan poets including Linda Nemec Foster, Jack Ridl, Josie Kearns, Zilka Joseph, and Phillip Sterling. Richmond Township Library, Palmer, Michigan. For more info, contact Ron at [email protected]. Linda Nemec Foster participates in the 35th anniversary gala to celebrate the Goddard College/Warren Wilson College MFA Program for Writers. Warren Wilson College, Asheville, North Carolina. Thursday, June 23, 7:00 PM-8:30 PM. Presentation with a lecture, reading, and discussion of the poetry of Larry Pike. Roethke House, Saginaw, Michigan. Tuesday, May 3, 6:00 PM-8:00 PM. Poetry workshop for adults inspired by the art and sculpture of Jim Dine. Meijer Gardens and Sculpture Park, Grand Rapids, Michigan. Wege Pavilion at the Grand Rapids Art Museum. The Grand Rapids Art Museum celebrates National Poetry Month with a reading, presentation, and workshop, “Nature and Haiku,” conducted by Linda Nemec Foster. Reading from her book, Listen to the Landscape, Foster will discuss the poetic form of haiku and lead a community workshop for children and adults. Literary Life Bookstore celebrates National Poetry Month with winners of its third annual poetry contest. Second-prize winner Linda Nemec Foster will join other winners and contest judge John Rybicki in a reading for the Grand Rapids community. For more info, contact Zachary at [email protected]. Youth Writing Festival at Calvin College. Linda Nemec Foster conducts poetry workshops for middle school students (in the morning) and high school students (in the afternoon). For more info, contact Kristin Otte at [email protected]. Poetry workshops at Meijer Gardens and Sculpture Park for the Jim Dine exhibit. Linda Nemec Foster conducts morning sessions for middle-school students and afternoon sessions with high school students. All-day poetry workshops for fourth-graders at Pine Ridge School, Cascade, Michigan. Linda Nemec Foster is the school’s poet-in-residence. Linda Nemec Foster debuts a poem commissioned by Aquinas College for Alumni Night. Aquinas College, Holmdene Manor House. Linda Nemec Foster will participate in a Poetry Tribute for Henrietta Epstein along with Ed Hirsch, M.L. Liebler, Gaylee Rubin, and other Michigan poets at the Detroit Public Library, Explorers Room, Woodward Ave, Detroit, Michigan. For more info, contact the event’s organizer, Leonard Kniffel at [email protected]. Linda Nemec Foster will give a guest lecture and reading for students in the advanced poetry workshop at Aquinas College, 1607 Robinson Rd. SE, Grand Rapids, Michigan. For more info, contact Miriam Pederson at [email protected]. Linda Nemec Foster reads her poetry along with poets Diane DeCillis and Mary Jo Firth Gillett at the Lido Gallery, 33535 Woodward Ave, Birmingham, Michigan. For more info, call the gallery at (248) 792-6248 or visit their website at www.everythingart.com. Linda Nemec Foster and Robert Fanning will read from their poetry books at Literary Life Bookstore & More, 758 Wealthy St. SE, Grand Rapids, MI 49503. For more info, contact Zachary at (616) 458-8418. Linda Nemec Foster reads her poem, “She Imagines the Seasons,” commissioned for the Urban Institute for Contemporary Arts’ 7th Annual Benefit Luncheon, Women + The Arts. Luncheon and program will be held at Eve in The B.O.B. at the corner of Monroe Avenue and Fulton Street, Grand Rapids, Michigan. For more info, contact Jill May at [email protected] or call (616) 454-7000 x. 26. Linda Nemec Foster joins poets Miriam Pederson and Edward Haworth Hoeppner to discuss the collaboration process between poets and visual artists. This panel discussion will be moderated by sculptor Ron Pederson and is part of the events presented in conjunction with ArtPrize, the International Arts Competition. Second floor conference room in the Cathedral Square complex, at the corner of Wealthy Street and Division Avenue, Grand Rapids, Michigan. For more info, contact Ron Pederson at [email protected]. Poetry reading at Central Michigan University. Linda Nemec Foster is the featured reader for the first program of the season for the CMU’s Visiting Writers Series sponsored by the English Department. For more info, contact Robert Fanning at [email protected]. Linda Nemec Foster will conduct a poetry workshop entitled, A Passion for Poetry, based on the current art exhibit at the Saugatuck Center for the Arts. Workshop takes place at the Center, 400 Culver Street, Saugatuck, MI 49453. For more info, contact Krista Reuter, Program Director at [email protected] or go to their website www.sc4a.org. Kerrytown Book Festival in Ann Arbor. Linda Nemec Foster will sign copies of her poetry book, Talking Diamonds, at the New Issues Press booth at 3:30 PM. She will also give a poetry reading with other New Issues authors (Khaled Mattawa, Josie Kearns, John Rybicki, Mary Ann Samyn) at the Crazy Wisdom Bookstore in Ann Arbor from 5:00-6:30 PM.For more info, contact Marianne Swierenga at [email protected]. Poetry reading to celebrate award winners for the Springfed Arts Annual Writing Awards. Linda Nemec Foster will read her first prize poem and other selections with fellow winners John Jeffire, Linda Sienkiewicz, Zilka Joseph, Terry Blackhawk, and Kristine Uyeda. Scarab Club, 217 Farnsworth, Detroit, MI. For more info, contact M.L. Liebler at [email protected]. Presentation with Dianne Carroll Burdick on their book, Listen to the Landscape, with poetry reading and book signing to follow the discussion. Women’s City Club of Grand Rapids, 254 E. Fulton, Grand Rapids, MI 49503. For more info, call (616) 459-332. Linda Nemec Foster reads with Robert VanderMolen and Patricia Clark at the Grand Rapids Public Library, 111 Library St. NE, Grand Rapids, MI 49503. For more info, contact Chris Byron at[email protected]. Linda Nemec Foster reads with Robert Fanning at ArtWorks on Main St. in Big Rapids, MI 49307. For more info, contact Foster Neill at [email protected]. Linda Nemec Foster celebrates National Poetry Month at the Literary Life Bookstore, 758 Wealthy St. SE, Grand Rapids, MI 49503. For more info, contact the store at (616) 458-8418. Linda Nemec Foster reads from and discusses her new book, Talking Diamonds, at the East Grand Rapids Library, 746 Lakeside Dr. SE, East Grand Rapids, MI 49506. For more info, contact Dawn Lewis at [email protected]. Poetry workshops for students inspired by the Michele Oka Doner Exhibit at the Meijer Gardens and Sculpture Park, Grand Rapids, MI. For more information, contact Heidi Holst at (616) 974-5225 or at [email protected]. Poetry reading and panel discussion on the theme, The Immigrant Experience in Poetry, for the annual meeting of the American Historical Association, San Diego Marriott Hotel, San Diego, CA. Literary Life Bookstore, 758 Wealthy St., Grand Rapids, MI. Book launch party to celebrate the publication of Linda Nemec Foster’s new book of poems, Talking Diamonds. Foster will do a reading and book signing. Reception will follow with music, light refreshments, wine, coffee/tea. For more info, contact Gina Gort at [email protected] or (616) 458-8418. Full-day poetry colloquium on Women, Poetry, and Faith sponsored by Loyola University in Chicago. Linda Nemec Foster will participate in poetry readings, panel discussions, and a seminar to discuss the themes of faith, creativity, and poetry. For more information, contact Rachel Hart Winter at [email protected] or (773) 508-3820. Linda Nemec Foster has been contracted to be Poet-in-Residence for the Forest Hills Public School District for the spring semester of 2009. Foster will conduct poetry workshops and class presentations in a number of the district’s schools from January to April, 2009. Linda Nemec Foster will give a unique poetry reading inspired by visual art complete with a Power Point presentation that features the particular art pieces. This reading is part of the Friday Arts Forum at the Grand Rapids Art Museum, 101 Monroe Center, Grand Rapids, Michigan. For more info, call Jean Boot at (616) 831-2930. Reading for the anthology, Fresh Water (Michigan State University Press) with other contributors (Alison Swan, Jackie Bartley, Lisa Lenzo, Gail Griffin). Herrick District Library, 300 S. River Ave., Holland, Michigan. For more info, call the library at (616) 355-3100. Poetry reading at the Festival of Faith and Writing, Calvin College, Prince Conference Center Board Room, Grand Rapids, Michigan. Foster is one of 15 poets invited to read at this national conference; there are other writers from other genres scheduled to present. A book-signing follows her reading. Other poets and writers include Mary Gordon, Paul Mariani, Rod Jellema, Mary Karr, and Franz Wright. For more info contact Festival Director Shelly LeMahieu Dunn at (616) 526-8720 or [email protected]. The entire Festival web site can be accessed at http://www.calvin.edu/festival. Linda Nemec Foster and other writers included in the award-winning anthology, Fresh Water, read their selections for the VanderVeen Center for the Book at the Grand Rapids Public Library, Ryerson Auditorium, 111 Library St. NE, Grand Rapids, MI 49503. For more information, contact Chris Byron at (616) 988-5402, ext. 5497. Fountain Street Church’s Keeler Gallery, “The Good Earth” exhibit: Dianne Carroll Burdick, photography; Linda Nemec Foster, poetry; reception and book signing for Listen to the Landscape. Summer Writers Series at Till Midnight Cafe. Linda Nemec Foster reads from the new book, Listen to the Landscape, and other poetry collections. Lowell Area Arts Council reception for InnerScapes, an art/writing exhibit juried by Poet Linda Nemec Foster and Artist Dianne Carroll Burdick. Book signing for Listen to the Landscape. Lowell Area Arts Council, 149 South Hudson, Lowell, MI 49331. August 4, 2006 at 6:30 PM Linda Nemec Foster reads her poetry at the Grand Rapids Art Museum. April 13, 2006 at 7:00 PM Linda Nemec Foster reads her poetry for Voices in Verses at the Grand Rapids Public Museum. April 11, 2006 at 7:00 PM Linda Nemec Foster reads with Miriam Pederson and Sue William Silverman in celebration of National Poetry Month at Schuler Books in Kentwood, Michigan. March 23, 2006 at 6:30 PM Linda Nemec Foster reads her poetry for the Catholic Social Services of Grand Rapids 60th Anniversary Celebration at the Meijer Gardens and Sculpture Park in Grand Rapids, Michigan. March 22, 2006 at 7:00 PM Linda Nemec Foster reads her poetry in celebration of Women’s History Month at Grand Rapids Community College Library, second floor. 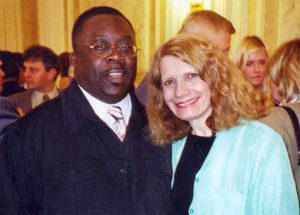 In June, 2005 Linda Nemec Foster was the cultural representative for the city of Grand Rapids, Michigan in an official Sister City delegation that visited Bielsko-Biala, Poland. The city in southern Poland is one of four places that has developed close ties with Grand Rapids in the Sister Cities International Organization. (The other three are in Japan, Italy, and the Ga District in Africa). More than twenty people comprised the delegation that included Grand Rapids mayor George Heartwell and his wife Susan, City Commissioner Robert Dean, Aquinas College President Harry Knopke and his wife Sheila, and various professors, scholars, and translators. As the first poet laureate of Grand Rapids, Foster had specific duties during the trip that included meeting with university professors to develop a college exchange program and talks with secondary school educators to discuss the possibilities of a high school exchange program. Her main goal was to develop relationships with prominent Polish poets and writers to explore the creation of a program in which these authors would be writers-in-residence at Aquinas College’s Contemporary Writers Series. With that goal in mind, she had a personal meeting with Adam Zagajewski, one of Poland’s most significant poets and writers. He was very interested in the Contemporary Writers Series and the residency program that would be connected with it. Foster is hoping that this cultural connection with Poland and Grand Rapids will be a reality in five years. In the meantime, she feels this trip was instrumental in starting the process. Grand Rapids , Michigan , poet Linda Nemec Foster will appear on the nationwide broadcast of the public radio literary program New Letters on the Air. Foster, the first Poet Laureate of Grand Rapids, Michigan, talks about her books of poetry, including her most recent, Amber Necklace from Gdansk. The program will be available on the public radio satellite on April 27, 2005, and can also be heard on the program’s website www.newletters.org. May 4-17. KANSAS CITY – Mo. Grand Rapids, Michigan, poet Linda Nemec Foster will appear on the nationwide broadcast of the public radio literary program New Letters on the Air. Foster, the first Poet Laureate of Grand Rapids, Michigan, talks about her books of poetry, including her most recent, Amber Necklace from Gdansk. The program will be available on the public radio satellite on April 27, 2005, and can also be heard on the program’s website www.newletters.org. May 4-17. Foster discusses one of her earliest books, A History of the Body, that details her thoughts and emotions during her first pregnancy. Foster also talks about her friendship with German-American writer and mentor, Lisel Mueller, and how she contributed to Foster’s getting in touch with her Polish heritage and the lives of her ancestors under Nazi rule. Linda Nemec Foster holds a B.A. in social science from Aquinas College, Michigan and an M.F.A. from Goddard College, Vermont in 1979. She received the Pushcart Prize for poetry in 1984, a National Writers’ Voice Project Fellowship in 1999 and was named Poet Laureate of Grand Rapids, Michigan in 2003. She lives in Grand Rapids Michigan where she has been working as the coordinator of the Contemporary Writer’s Series at Aquinas College since 1997. Available to over 400 public radio stations nationwide, New Letters on the Air is distributed weekly via the Public Radio Satellite System, and also is streamed in RealAudio format on our website, http://www.newletters.org. New Letters on the Air is public radio’s longest-running literary program, and is a production of New Letters, a magazine of new writing, published at the University of Missouri-Kansas City. The program is funded in part by the Missouri Arts Council, a state agency. New Letters on the Air is pleased to offer a catalog of archive programs available on audiocassette or CD. Call Angela Elam or Dennis Conrow at (816) 235-1159, or write to 5101 Rockhill Road, Kansas City, MO 64110, or email [email protected] to place orders, or to comment on the program. People with speech or hearing impairments may call Relay Missouri at (800) 735-2466 (voice). Also visit www.newletters.org for more information or to order past programs. Grand Rapids Poet Laureate Linda Nemec Foster is doing a poetry reading and presentation at the Grand Rapids Art Museum on Friday, February 4 from 6:00 PM to 6:30 PM in the Museum’s Cook Auditorium (second floor). The reading is from work that was specifically inspired by the visual arts and will include a slide presentation of those pieces. A question and answer period and book signing will follow. This event is free and open to the public. Linda Nemec Foster gives a reading from her new work at University of Michigan-Dearborn. Linda Nemec Foster presents her poetry at Thornapple Evangelical Covenant Church, 6595 Cascade Road, Ada, Michigan. Her work will be presented in the context of Woman as Immigrant. Linda Nemec Foster is the featured poet at the Writers Place in Kansas City, Missouri. Linda Nemec Foster critiques poetry manuscripts and conducts a poetry session at the Detroit Working Writers Conference at Schoolcraft College, 18600 Haggerty Road, Livonia, Michigan 48152. Linda Nemec Foster reads from her critically acclaimed book, Amber Necklace From Gdansk, at the Hamtramck Public Library in celebration of Polish Heritage Month. Linda Nemec Foster will be reading poems inspired by visual art for a special exhibit at the Birmingham Bloomfield Art Center, 1516 South Cranbrook Road, Birmingham, Michigan 48009. Monday, June 14, 2004 at 6-8 PM. Linda Nemec Foster will read a new poem especially written to celebrate the 35th anniversary of La Grande Vitesse, Alexander Calder’s magnificent public sculpture that has graced the Grand Rapids’ City Hall Plaza since 1969. The sculpture was the first public arts project to be funded by the National Endowment for the Arts. Linda Nemec Foster reads her poetry in celebration of Grand Rapids’ neighborhoods. The program,” We Sing the City Electric: Poetry from the Neighborhoods,” is sponsored by the Grand Rapids Humanities Council. The reading takes place at the Grand Rapids Public Library, 111 Library Street, Grand Rapids, Michigan. Linda Nemec Foster is the featured poet at the 7th Annual Theodore Roethke Poetry Festival. Reading takes place at the Anderson Enrichment Center, 120 Ezra Rust Drive, Saginaw, Michigan. Linda Nemec Foster will present a talk entitled “Publish or Perish: How Poems are Created, Written, and Published.” Vandenberg Center for the Book Arts, Grand Rapids Public Library, Main Branch, 111 Library St NE, Grand Rapids, MI. Linda Nemec Foster will moderate and participate in a panel discussion celebrating the poetry of Lisel Mueller, Pulitzer Prize Winner. Associated Writing Programs Annual Conference, Palmer House Hilton Hotel, Chicago, IL. Linda Nemec Foster presents a poetry reading and discussion of all six of her published books. Peninsula Writers March event. Schuler Books and Music, 2660 28th Street, Grand Rapids, MI. Friday, January 23, 2004 at 7:30 PM. Poetry reading and book signing for Amber Necklace from Gdansk. Poet Laureate Linda Nemec Foster reads a poem specifically written for the inauguration of the new mayor, George Heartwell. Grand Rapids City Hall, 9th floor, City Commissioners Conference Room. Shaman Drum Bookstore, Ann Arbor, MI, 8:00 PM. Poetry reading in celebration of Women’s History Month – Fenton Public Library. Poetry workshop based on visual art, Franciscan Center, Lowell, MI, 7:00 PM. Competition, Grand Rapids Public Library, 7:00 PM. 9:00 AM to 11:00 AM. Poetry reading in celebration of the opening of the new Grand Rapids Public Library, 10:00 AM. Creative Writing Seminars at East Grand Rapids Middle School, all day sessions. Creative Writing Workshops at East Grand Rapids High School, 10:00 AM to 3:00 PM.